Spot Color vs Full Color Printing: What's the Difference? | Wisconsin Converting, Inc.
Spot Color vs Full Color Printing: What's the Difference? As a manufacturer and printer of custom paper bags, we are often asked about the difference between spot and full color printing. The difference is the way the ink is applied to the paper. Spot color printing applies each color separately in a separate layer – meaning you will have one printing plate per each ink color. 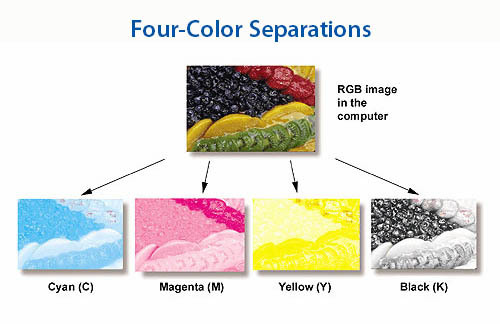 Full color printing is a most often a digital or offset process where all colors are printed at the same time – in different combinations of Cyan (C), Magenta (M), Yellow (Y), and Black (K-key). Our bag machines use flexographic printing to print on paper bags using spot color. Spot printing uses pre-mixed colors, usually in 1, 2, or 3 color printing applications. Each color is applied to the paper separately and requires it’s own unique printing plate. Most often, Pantone or PMS colors are used in spot printing. For example in the photos below, we show a two-color design using Pantone Red 185u and Black. When this artwork is printed on the bag, the lightest color will be laid down first and the darkest color will be the last to be applied. Can provide cost savings. When fewer than 4 colors are printed, you’ll need fewer plates. Designs for spot printing are also usually less intricate, making the plates cost less than those for full color. Provides more consistent color. Using pre-mixed PMS colors means a better and more consistent color can be achieved. Used by WCI for in-line and post printed paper bags. Full color, or 4-color process printing is usually done in an offset or digital printing environment and is ideal for situations with full-color photos or print with multiple colors. Like the color printer you may have at home or in your office, colors are achieved by mixing percentages of the CMYK bases to achieve the entire color spectrum. As shown below, the full color image is broken down into a plate for each of the four base colors. Also called 4-color printing, 4-color process, process printing, CMYK printing. Most often used for printing on stickers, labels, catalogs, business cards, and items will full-color photos. Useful for designs where multiple colors and shades are desired. Not available on paper bags manufactured at WCI. We print paper bags in up to 4 spot colors on a variety of eco-friendly packaging options. Number of colors available varies by bag type and size. Visit our printing specifications page for stock ink colors, print capabilities, and more helpful information.